For adults who watch the Toy Story films and see parallels with their own lives, and that of their children, the series can be incredibly bittersweet. As well as feeling nostalgia for their own childhood, parents can also note how Andy's relationship with Woody and his toys is a lot like the one that a teenager has with their parents - children grow up quickly and, as they head to university or to a new job or into the house of their new partner, their toys (just like the parents) get left behind. It's a sad but inevitable truth and it's one which is captured in a moment of sublime beauty in Mamoru Hosoda's feature Wolf Children; a single howl reverberating against the vast expanse of a rural landscape is heard by a solitary, morose mother in a moment that is as devastating as it is reserved, as pathos-filled as it is genuinely, sublimely breath-taking. Hosoda (the incredible mind behind the gorgeous The Girl Who Leapt Through Time and Summer Wars too) tells a magic-realist fable which begins, as many of the great tales do, with young love; Hana, a bookish student, falls in love (in almost fairy-tale like fashion) with a mysterious man who, it transpires, hides his true identity as a werewolf. If the great love affairs of literature, art and movies all have obstacles to overcome such as family feuds (Romeo & Juliet), class (Wuthering Heights) and being entirely unsuitable for one another (Winona Ryder and Ethan Hawke in Reality Bites), then Hana and her beau will have to do their best too to overcome the latter's propensity to transform into a feral wolf at inopportune moments. They marry and even have children (whom it transpires have also received his affliction) but, rather than live happily ever after, run into trouble when the wolf-man fails to return one day. At this point, Hosoda's film really kicks into gear and features a wonderful tranformation itself, from a lovely movie into a truly special feature - it was Pedro Almodovor who once dedicated one of his features "to mothers" but, in this writer's eyes, there's no greater movie which pays tribute to the infinite nature of maternal love (and the hardships single parents must face) than this one. 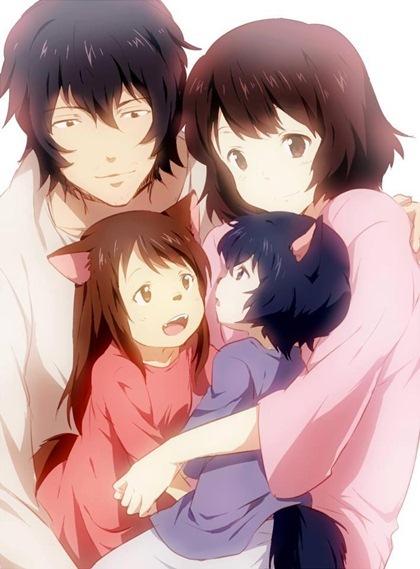 Hana's children, Yuki and Ame are both free spirits and, if keeping an eye on young siblings is difficult at the best of times, this is multiplied by the fact that Hana doesn't have a real support network; that her children can transform into wolves and run away at any given time adds to the exhausting hardship of being a single parent. Yet, despite an unaccepting society and barely enough hours in the day to get enough sleep, Hana never once considers giving up on her two very different children even as the siblings begin to grow up and grow apart. This isn't the tale of someone saving the world from an alien invasion or anything as far fetched as that but, rather much more remarkably, the every day story of the stoic determination and love a woman holds in her heart for her children, regardless of how difficult life get for her. The movie slowly unfolds as we bear witness to Hana's struggles and the heartbreak that comes with, having given her children everything she has, spiritually and emotionally, accepting that both her children must ultimately move on and leave her behind. Having watched thousands of films its rare that any moment in cinema makes me realise I'm watching, feeling and experiencing something I have not in other movies or, indeed, elsewhere in life. When I first saw Hana hear the howl at the climax of this delightful animation, I realised this was such an instance; guttural, beautiful and profoundly morose. In moments like this Wolf Children shows what cinema can achieve at its best - its a medium which helps us understand the world around us and, perhaps more importantly, make sense of ourselves and our own experiences. Very rarely has the beating, yearning heart of humanity been committed to celluloid with such honesty, earnesty and artistry. The Wolf Children film is AMAZING. So cute, joyful and sad all at the same time. I watched it on the plane randomly and really glad I did! There's few things better than catching a film randomly and it turning out to be fantastic!